An erect bushy shrub with long branches. Broad spear-shaped dark green glossy leaves. The large spikes of rich red-purple flowers, they are dense and smother the bush, appearing in summer and autumn. It will grow in sun or semi-shade, best in well drained soil, will grow in dry sites. Grows in exposed and coastal sites, and will always look best in these conditions. 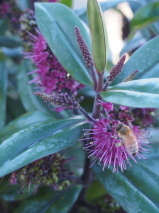 Jack Hobbs raised this Hebe cultivar at the Auckland Regional Botanic Gardens.